While the Assassin’s Creed games have their fair dose of fiction, they surely do a lot of investigation in order to prepare their games. We (the gamers) have been to Jerusalem, Acre, Damascus, Venice, Florence, Colonial USA, the Caribbean, Paris, London, Egypt and later this year, Ancient Greece. While they started relatively simplistic with the first game, each subsequent game has had a more rich depiction of each city the main character has been to. The jump from AC1 (“Well, here is Jerusalem”) to AC2 (“Here is some real-world info on this Venetian building”) was good enough, but Ubisoft seems to have reached peak Edutainment with Origins’ Discovery Tour. 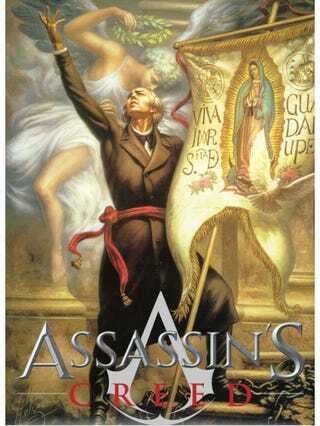 So, how about a game set in the Mexican Independence era? It already has Conspiracies, “bad” guys (pretty much Spain) and, of course, the whole “let’s keep things underground so we’re not discovered” things that do a good campaign; and the Assasins vs Templars could easily been reworked into Independentistas vs GachupinesEspañoles. It has also several characters that could be used as NPC-Good-Guys (Morelos, Hidalgo, La Corregidora, etc.) with already existing stories that can be tweaked into a more player-involved gameplay, just like DaVinci was on Assasins Creed 2. A game set in this era could give Ubisoft the chance of pleasing both sides of the Doblaje en Español war: It could have both Spain Spanish and Mexican Spanish (for Bad guys and Good Guys, respectively). It takes place about 100 years after the Independence, but an Assassin’s Creed: Revolución could use several of the locales and assets with a minimum of modification. Would make learning about Mexico’s History something that can be achieved via playing a game! Of course, the international appeal would be way less that the more internationally Egypt and Greece themes. What do you think? Would this be interesting enough for an Assassin’s Creed?